Super Middleweight contender Derrick “Take It To The Bank” Webster (25-1, 13 KOs) feels the time is now to take on the big boys of the division, but in order to secure a bout with a top contender or champion, he first must get by Oscar Riojas (16-9-1, 5 KOs) of Monterrey, Mexico in the 10-round main event this Friday night at The Claridge Hotel. The show is promoted by Mis Downing Promotions. Webster of Glassboro, New Jersey has been working hard in the gym as he prepares for this most important bout. “I have had an amazing camp, I have been getting great work and seeing different looks,” said Webster, who has been working under the guidance of his long-time trainer Denny Brown. In Riojas, he is facing a battle-tested veteran who has taken on seven undefeated opponents as well as 2 world title challengers. Webster has been looking for a signature fight in the suddenly hot 168-pound division, and after this fight on Friday, Webster will be looking to make his mark. This is a special weekend for Atlantic City Boxing as the Atlantic City Boxing Hall of fame will have it’s 2nd induction weekend, and may of the legends of the sport will be in attendance to watch Webster fight. In the 4-round co-feature bout, Isiah Seldon (11-1-1, 4 KOs) of Atlantic City takes on Lamar Harris (9-14-4, 5 KOs) of St. Louis in a four-round middleweight bout. In a eight-round bout, Prince Badi Ajamu (28-4-1, 15 KOs) of Camden, NJ rematches Edgar Perez (7-24, 3 KOs) of Chicago in a cruiserweight bout. Carlos Rodriguez of Louisville, Kentucky will make his pro debut will fight Eliot Brown (1-4, 1 KO) of Erie, PA in a lightweight bout. Emmanuel Rodriguez (2-0) of Newark, NJ will fight pro debuting Danzel Bowling of Baltimore in a super flyweight bout. Lester Brown (3-0-1, 1 KO) of the Bahamas will fight David Payne (0-1) of Maryland in a lightweight bout. Isaiah Hart of Atlantic City will make his pro debut against Leon DeShields (0-3) of Philadelphia in a middleweight bout. 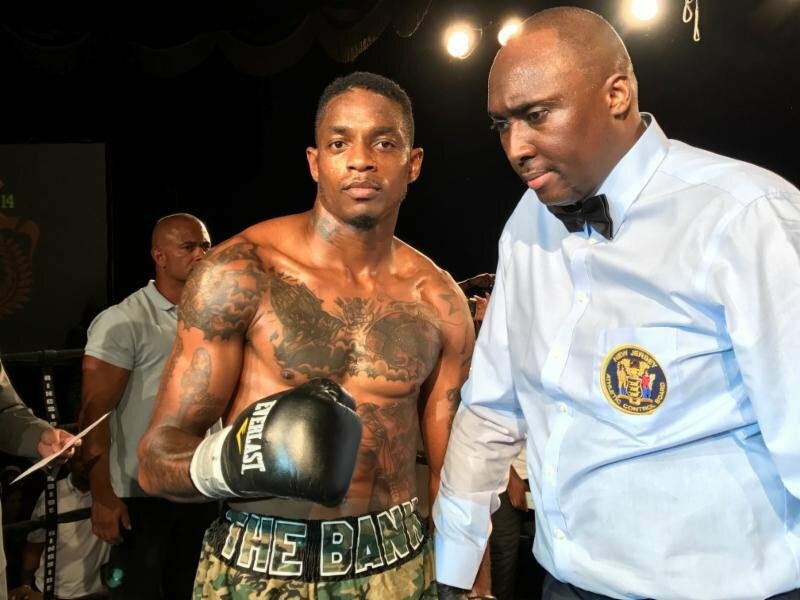 James Wilkins (3-0, 3 KOs) of Brooklyn, NY will scrap with Joe Gbolo (3-2-2, 1 KO) of Newbergh, New York in a lightweight bout. Feliz Manzueta (1-0) of Dover, Delaware will box against Antonio Allen (0-7-1) of Philadelphia in a welterweight bout. Previous boxing news: Canelo vs. GGG II: WBC…Change of Heart?